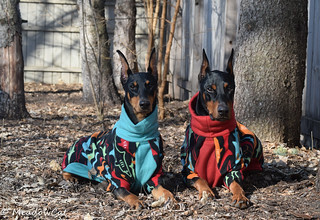 Doberman Forum : Doberman Breed Dog Forums > Doberman Specific Chat > Doberman Health > Any recommendations for health insurance? Any recommendations for health insurance? I’ve done a lot of google searching for a good insurance for my Morticia and was going to go with nationwide.. but thought before I go thru with it maybe ask here! Some Of my friends said good things about nationwide.. but I’m still unsure! I also wasn’t sure if it was worth paying each month and not needing it often but now I’m thinking she may need a lot more than her shots!! I have Healthy Paws, one thing I recommend is that you choose an insurance with a yearly deductible vs. a per incident. I have had Embrace for years, and recommend it. It's important to understand what is and is not covered, what your deductible is, what might be pre-existing, whether genetic or breed specific conditions are covered, etc. I recommend calling and talking to a representative to be sure you understand your policy. I see so many people upset with the company when something isn't covered but they clearly did not understand the policy they bought. Nationwide used to be VPI, and they screwed us for multiple thousands of dollars. Plus their rates jumped this year. Read all the reviews you can. I have Embrace. I prefer the annual deducible that they offer as opposed to the per incident. They also lower your deductible for your next claim $50 every year that they don't pay out. Of course the minute they do, your deductible goes back up and you start over again. McCoys deducible is currently down by $200. When I was looking for new insurance, I was a bit confused by the different company's offerings and even their offerings within each company. With most, you can pretty much tailor a plan to fit your needs. So I talked to reps from several companies. The two that impressed me the most were Embrace and Trupanion. I went with Embrace simply because of the way they handle the deductible. McCoy has never been sick, so I can't speak to Embrace's handling of claims, but everyone I now that has Embrace and made claims has been happy. -Pretty much everyones pet insurance went up fairly drastically this year. - Get insurance ASAP. It will save you having to deal with "pre-existing" conditions issues. I have Pet Plan, they've been good about covering claims for me but their deductibles do go up every year, sometimes by quite a bit. I like them because they cover exam fees, medicine, and physical/alternative therapy without needing any riders. They also had the most liberal exclusion list when I was researching companies a couple years ago. Every time I get a new dog I re-evaluate all the options and I have always stuck with Pet Plan, I've used them with 4 dogs over about 8 years. I made a profit on my two that have passed (wobblers, cancer, arthritis, pneumonia, etc. ), but haven't made a lot of claims on my current two. Thanks so much! I don’t think I looked at embrace! I signed up with nationwide when I got her BUT quickly cancelled as I wanted to do more research first!! I wasn’t even sure I’d really use it and now of course, with what’s going on I wish she had a currant plan! Looks like I have some homework to do! And yes I got a bit overwhelmed at what’s covered and what’s not as it wasn’t clear to me with the few I was looking at! I like the idea of calling and having it explained. Thanks so much everyone for getting back to me! I thought this was the perfect place to ask as I’m surrounded by animal families who care! I’ve never had a pet insurance so it’s all new! I have Embrace for both my dogs a dobie and a yellow lab 15k per year 90% coverage and ortho waver for instant coverage with vet check. also we got the wellness coverage which is your pool of money and they add some to it a little but it takes care of annual dental and check-ups shots lavb and that sort of thing. chose them over nationwide offered at my wife's work. Thanks! So good to know! I wanted one that included wellness too!! And dental! Looks like embrace will be the way to go!